The Purple and WhiteWhat is Hollywood’s Problem with Anime? What is Hollywood’s Problem with Anime? When I went to go see “Logan” a few weeks ago with some friends, one of the trailers that played before the film was for the live-action adaptation of “Ghost in the Shell”. Upon seeing said trailer, my first reaction was something along the lines of “Oh, F–k! 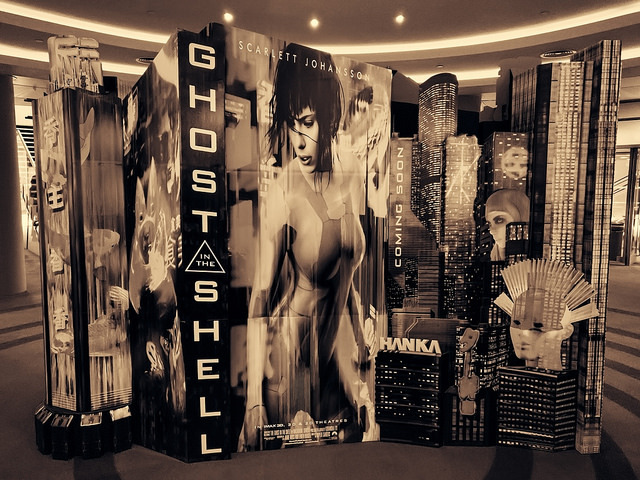 Not another one!” Since the film has come out, and has received relatively harsh reviews, it got me wondering: why does Hollywood fail so badly when it comes to adapting anime franchises such as “Ghost in the Shell” or “Dragonball”? My best guess for why this is a recurring issue would be the writing staff who are unfamiliar with the depth of the narrative and how to properly understand the ways in which the characters work. Since characters such as Goku, the protagonist of the “Dragonball” series, are beloved characters who experience story arcs that allow them to experience depth as a character, putting said characters into a film does not do them justice. Also, since Japanese story-telling methods are based on longer and more drawn-out arcs than the one-shot plots those that the writing staff in Hollywood are familiar with, trying to cram characters like Goku or Moto Kusanagi (the protagonist of “Ghost in the Shell”) into Western writing standards does not work. A prime example of this was back in 2009, with the release of the god-awful movie “Dragonball: Evolution”. In what fans, as well as critics, consider to be an extreme insult to the source material, Goku was made into an awkward high school student portrayed by a white actor instead of the goofy yet powerful Saiyan of the “Dragonball” series that they know and love. This damning view of “Dragonball: Evolution” can be summed up in the review given on Rotten Tomatoes. According to the review, “Dragonball: Evolution lacks the magic that made the books upon which it was based a cult sensation.” Thus, in the words of film critic Zac Bertschy, “The fans were right” to be outraged at casting a white actor as Goku, the lack of proper exposition, and other failings. Since the writing staff at Fox Studios was dealing with the story-arc structure crucial for character development, an element common to Japanese material like “Hellsing” or “Berserk”, cramming multiple seasons’ worth of backstory into a single narrative, as well as even cutting out crucial elements, led to the disastrous structure of the movie. Besides that aspect of it, casting white actors in franchises where Asian actors should portray the main characters also reflects badly on the studio. Case in point for this situation can be found once again in “Ghost in the Shell” and “Dragonball: Evolution”, with Scarlett Johansson and Justin Chatwin (both of whom are white actors), portraying characters that are Japanese and Saiyan respectively, not white. Besides causing fans of these properties, myself included, to feel like Hollywood has no clue how to properly adapt anime this trend of whitewashing characters originating in anime properties also casts a racist light on the studios making these films. With that in mind, if a major film studio were to do a proper adaptation of an anime property like “One Piece” or “Cowboy Bebop”, what should be done? My first suggestion, besides my stance of “For the love of the gods don’t make a movie out of this!” would be to make the film an animated feature, not live action, since live-action adaptation of anime does not look right. Secondly, make sure that the writers for the film have experience with the material being adapted, such as English-language translators for the manga these anime properties are based off of. Finally, instead of trying to cram an entire season’s worth of character development and plot into one film, either do an original adventure for the character or don’t do the film at all. If Hollywood were to follow these guidelines when adapting anime for live-action fare, they may perhaps find that they would receive less anger for their efforts and maybe even a positive review of their work. 1 Comment on What is Hollywood’s Problem with Anime? I think your last point is quite valid. I wouldn’t mind live action films if they just wrote a decent story for a film as it is clearly not going to be possible to adapt an entire season or series. However Dragonball: Evolution didn’t just take massive liberties with the source material, it’s a terrible movie in its own right. Even if you know nothing about Dragonball prior to seeing that film, it is poorly directed, poorly written, and the acting is sub-par. I recently had the chance to see the Ghost in the Shell movie. While I get people expecting to see the anime recreated might be annoyed at things, the movie itself is actually pretty decent (minus some overacting from some of the support cast) and the story they tell is actually reasonable for a single movie. More importantly, non-anime fans are enjoying Ghost in the Shell (the movie) without any prior knowledge or need to know any of the history, which actually means it works as a film and it isn’t relying on fans to fill in the blanks.